ALBANY - Hours before polls closed, a hotline for complaints related to New York's presidential primary elections had already received more calls than it did during the 2012 cycle, according to state Attorney General Eric Schneiderman's office. Schneiderman's hotline received 562 complaints from 6 a.m. to 3:50 p.m., according to spokesman Nick Benson. Another 140 complaints were sent by email, Benson said. That's more than four times the roughly 150 complaints the attorney general's office received during the 2012 general election. "This is by far the largest volume of complaints we have received for an election since Attorney General Schneiderman took office in 2011," Benson said in an email. New York is not a winner-take-all primary, so delegates will be divided among the candidates based on ballots cast by party voters. The most common complaint? Individuals who tried to vote but were told they weren't registered, according to Schneiderman's office. The second-most popular complaint came from those who were registered but not in the party whose primary they were hoping to vote in. New York is rarely a competitive state in the presidential primary process and counties were preparing for a voter turnout that's much higher than normal. And the state's arcane voter-registration rules led to confusion for some voters — particularly those hoping to cast a ballot for the first time. The state is a "closed" primary state, meaning only those enrolled in the Democratic or Republic parties can vote in the primaries. Polls close at 9 p.m., but opened at different times in different parts of the state: 6 a.m. in New York City, Long Island and the counties of Westchester, Rockland, Putnam, Orange and Erie; and noon in the rest of the state. State election law required new voters to be registered by late March in order to vote in Tuesday's presidential primaries. For those who were previously registered but wanted to switch party enrollment, that move had to be completed by last October. Former Secretary of State Hillary Clinton and Vermont Sen. Bernie Sanders are squaring off for the Democratic presidential primary, while businessman Donald Trump, Texas Sen. Ted Cruz and Ohio Gov. John Kasich are seeking the Republican nod. Meanwhile, in New York City, Mayor Bill de Blasio and Comptroller Scott Stringer questioned why nearly 120,000 active and inactive Democratic voters were purged from the voter rolls in Brooklyn, which led to criticism from Sanders and voters-rights groups. The city Board of Elections said the purge was part of regular maintenance of the city's voter rolls. State law requires the city and counties across the state to separate active and inactive voters. “It has been reported to us from voters and voting rights monitors that the voting lists in Brooklyn contain numerous errors, including the purging of entire buildings and blocks of voters from the voting lists," de Blasio said in a statement. "I am calling on the Board of Election to reverse that purge and update the lists again using Central, not Brooklyn borough, Board of Election staff." ALBANY - A federal judge denied a long-shot bid for an immediate order allowing independent voters to participate in New York's presidential primaries Tuesday, but the underlying lawsuit will proceed later this month. U.S. District Judge Joanna Seybert of Long Island on Tuesday rejected a request for a temporary restraining order that would have allowed all voters to cast a ballot in Tuesday's primaries, regardless of party affiliation. Election Justice USA, a voters-rights organization, filed an emergency lawsuit Monday against the state Board of Elections on behalf of a group of Democratic voters who claim they were unlawfully purged from voting rolls or weren't enrolled in the proper party. As part of the lawsuit, the group is seeking an order allowing non-affiliated voters to participate in primaries, which in New York are open only to those enrolled in a political party. Seybert declined to issue an immediate order Tuesday, instead allowing the lawsuit to go before a judge at a later date. Both sides are next scheduled to file further documents in court later this month. Under state law, new voters had to be registered to vote and enrolled in a political party by late March in order to vote Tuesday. Previously registered voters who wanted to switch parties had to do so before last October. Supporters of Democratic candidate Bernie Sanders — who has attracted interest from many first-time voters — made use of social media to urge non-affiliated voters to cast a provisional ballot Tuesday in hopes of the lawsuit being successful. Sanders, who is facing off against former Secretary of State Hillary Clinton for the Democratic presidential nomination, decried the state's closed primary system Tuesday, calling it an "impediment" to the independents who want to vote. 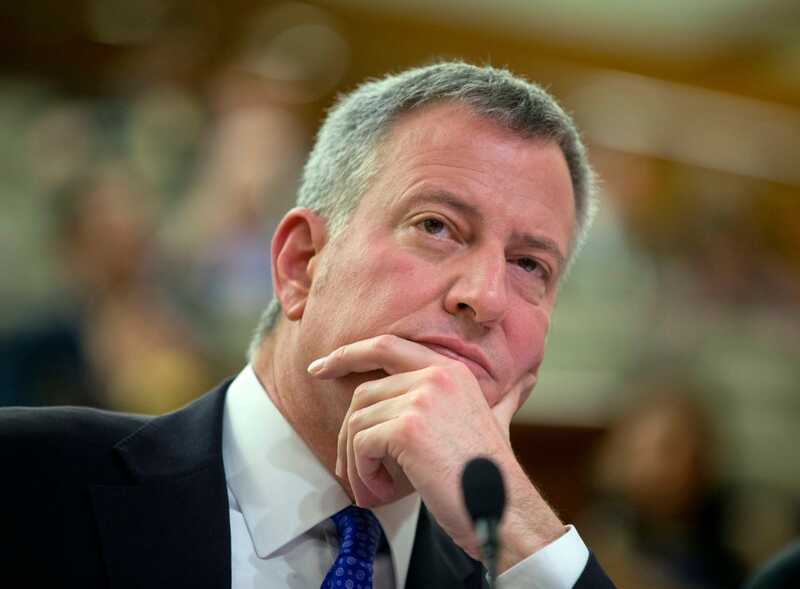 6:54 p.m.: New York City Mayor Bill de Blasio issued a statement Tuesday condemning the reported purging of voters from voting lists and confirming his support for an audit also announced that day of the city’s Board of Elections. WNYC reported Monday that more than 60,000 Democratic voters in Brooklyn had vanished from records with no clear reason why. The mayor’s statement came during a day riddled with voter complaints in the city ranging from a lack of ballots to vanished voter rolls at multiple polling sites, according to the station. Beyond New York City, a hotline for complaints related to New York's presidential primary elections has already received more calls than it did during the 2012 cycle, according to state Attorney General Eric Schneiderman's office. New York is rarely a competitive state in the presidential primary process and counties were preparing for a voter turnout that's much higher than normal. And the state's arcane voter-registration rules led to confusion for some voters -- particularly those hoping to cast a ballot for the first time. 4:56 p.m.: Along New York's Hudson Valley, voters considered key national issues as they cast their votes. In Dutchess and Ulster counties, they voiced skepticism about the primary process, too. Republican voter Maureen Gillen said for her, the choice is clear. The 69-year-old Village of Pawling resident cast her vote at Pawling Town Hall for "the only man worth voting for," she said. "Donald Trump." Gillen said Trump is "the only man Putin would speak English to," but doesn't think he will win the presidency. "They'll stop him at the convention," she said. In New York, only those registered as a voter in the Democratic or Republican party can participate in the primary election. For Sanders supporter Robin Locker Lacey, that stipulation raises some red flags. Lacey, who was a Sanders volunteer and canvassed for his campaign in the area before heading out to vote for him today in the City of Poughkeepsie, said how we run elections should be changed. "Personally, I really think a lot of the voter laws need to be changed a little bit, because I know that there’s a lot of issues with Independent voters not realizing that they’re not going to be able to vote. That’s something that should be changed." City of Poughkeepsie resident Tommie Stephens said it's his work as a health care aide that helped influence his vote for Clinton. "I see what many of the patients I work with go through on a daily basis (to pay for health care)," the 58-year-old Democrat voter said. Stephens said he wants to see health care expanded, and believes Clinton will help accomplish that. Dutchess County Sheriff Butch Anderson told us why voted for Trump. Updated, 3 p.m.: At a polling place upstate in Greece, a suburb of Rochester, 20 people had voted by 12:10 p.m. In past primaries, one poll worker said, only a couple of people voted in the first hour. But some voters faced confusion in Greece as they showed up at the wrong polling locations. The Greece Central School District sent out postcards in past weeks reminding residents of their polling places for the Board of Education vote on May 17. Many residents went to the locations detailed on the cards instead of their primary day polling location, which was explained in a letter sent earlier this year. Michele Frangakis said she was first in line there but was not allowed to cast a ballot. When she tried to check in, her name wasn’t listed on any documentation. About 50 people had experienced this at the same location about two hours into the voting period Tuesday, voting volunteers estimated. “I wasn’t sure what I was supposed to do,” said Frangakis. She waited as polling volunteers called around to other locations to find where she was supposed to vote, she said. She ended up at Lake Shore Fire Department on Ling Road, where she’s voted in previous years. 1:33 p.m.: In the Hudson River village of Nyack, poll workers said turnout was larger than in previous year. By 8:30 a.m., more than 60 people had voted at Grace Episcopal Church and Living Christ Church — almost double the usual number. "I was surprised at how many people came right at 6 a.m. — it was way more than usual for a primary," said Gladys Najara, a poll inspector at Rochambeau School in White Plains. Olga Klimak, a poll inspector of 15 years, was working also at the Rochambeau School. She said the location saw 50 voters by 10 a.m.—the number of people her polling locations usually see in an entire day for primaries. Karin Arduino, an election inspector at Tarrytown Village Hall, said residents who haven't voted in previous primaries were turning out this year. "There are a lot of new voters — voters I'm not used to seeing," Arduino said. In New York, only registered voters enrolled as a Republican or Democrat may vote in the party primaries. 11:51 a.m.: Polls opened at 6 a.m., and by 6:05 a.m., strangers were chatting in Yonkers after making their selections. Two men talked outside St. Ann's School on Brewster Avenue about the need to get someone other than Chappaqua resident Hillary Clinton into office. Nick Rigas, a senior at Harrison’s Manhattanville College, said he's "voting for the guy who's going to help me in the real world." "I've done my research. I'm not a straight Democrat, but he's the right choice for me," Nick Rigas, 22, said of Bernie Sanders. At Grafflin Elementary School in Chappaqua, Paula Kurth, an elections chairperson, said turnout this morning has been "huge." In the first two hours of open polling, one district at the school had 96 voters and the other had 85, which Kurth called a "very high turnout. "People were here at five minutes to 6 (a.m.) waiting to vote. One man was tapping his watch," she said. "It's exciting." Clinton and her husband, former President Bill Clinton voted at Grafflin after 8 a.m.
On the Republican side, Trump supporters showed up to support the native New Yorker. "I think he's going to be good for the economy. I think he's going to speak his mind. I think he's going to be tough," said Richard DeVito, a 25-year resident of Mount Vernon. 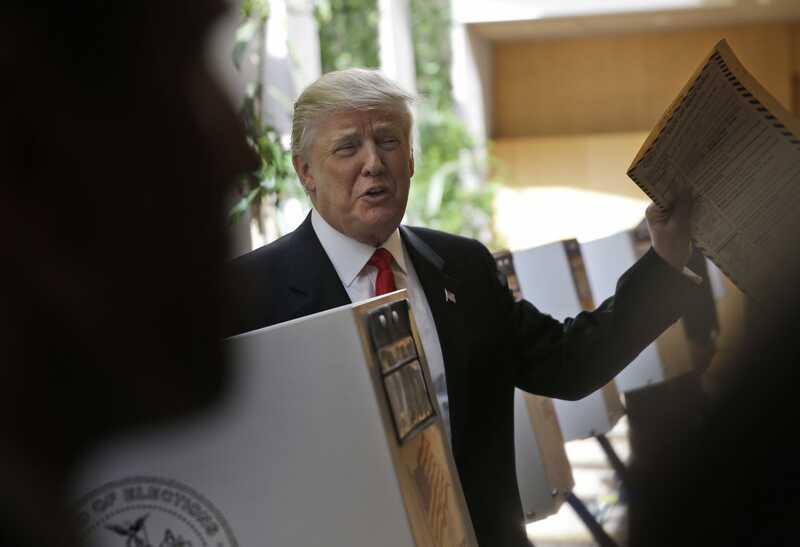 6:51 a.m.: Casting a ballot in Tuesday's New York presidential primaries? Leave the buttons and stickers at home. Supporters of Democratic presidential hopeful Bernie Sanders have been spreading a graphic on social media, warning fellow Bernie backers that it's "against the law" to wear pro-candidate buttons, stickers and T-shirts to vote. It's true: New York law prohibits electioneering within 100 feet of entrances to polling places when the polls are open. That includes any "political banner, button, poster or placard," according to the section 8-104 of the state's election law. John Conklin, a spokesman for the state Board of Elections, said the basic curriculum for poll workers teaches them to enforce the electioneering ban. Generally, Conklin said, poll workers don't make a "big deal" of it – rather, they will ask you to remove your hat or button or cover up a pro-candidate shirt. "If the person is actually campaigning for a candidate (and) causing a disturbance, the poll workers can have the person removed," Conklin wrote in an email. A poll worker can technically be charged with a misdemeanor if they spot electioneering and don't try to stop it, he added.